Announcing the Intertops Poker Room!! Gambling World is Proud to Present Intertops Poker Room! Building on their reputation of fairness in gaming in the sports betting industry, this latest offering from Intertops Sportsbook and Casino is now causing quite a stir in both the Poker and Sportsbook World. Wanting to offer their players the best in poker play, they have chosen Microgaming Software as the platform for their poker room. 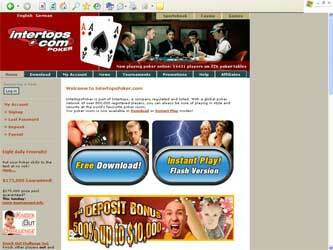 By using Microgaming Poker Software players are exposed to some of the best poker game software on the internet. This also means that the poker room is part of the Prima Poker Network. Being part of the Prima Network means that players will be playing against other poker players playing in other Prima rooms that belong to the network. This makes for larger games and tournaments. Larger games means more players, and more players mean more money to be won. There are different betting limits also. The Intertops Poker Room offers poker play with Fixed Limit, Pot Limit and No Limit betting games. There is always a long list of promotions and tournaments offered as well. Regularly we hear stories of visitors winning the bad beat jackpot or the magic hand promotion. There are numerous Poker Tournaments with $1000, $2500, $3000 and more up to $100,000 Jackpots each and every week. And getting help when you need it is simple too. You can contact the support department by email, or toll free telephone. They have a very knowledgeable support staff and usually answer your question satisfactorily the first time. Downloading the software and creating an account is pretty straight forward and simple to do. And once you do and start playing, you can easily qualify for a nice signup bonus. When you make your first deposit, you become eligible for a 500% match bonus up to $10,0000. All you need do is open an account and use the Bonus Code 10kBonus. Five times your original deposit will be credited to your bonus account and as you continue to play raked hands you will generate points. These points will accumulate and for each point $1 will be credited to your poker account until your entire bonus has been credited.